Smart Generation Health Drink with Goodness of Gau Peeyush. Traditional Ayurvedic Brain Tonic for growing Kids. Improves Mental & Physical Health in growing Kids. One big reason why child suffer from memory loss is an insufficient supply of necessary Nutrients to the brain. The life of the body is in the blood, as it literally feeds and nourishes every cell within our bodies. We have entered Twenty first Century……The world of tremendous competition. Competition as previously seen only in sports has now entered all fields of life. Even junior kids from KG class are pulled unnecessarily towards competition. Now every student has to be expert in arts & sports fields along with his studies. It means memory span should be developed in multi-dimentional way. Keeping an eye on all these competitive aspects, to boost the mental ability, to improve the memory span, to suppress the mental tensions & to enhance physical strength, Dhanwantari has launched a research based special product “Smruti-Rich Granules”. Human Brain development starts from embryonic life. It develops very rapidly till the age of ten years. During this period, in-house environment should be healthy & positive which helps improve the brain development in child. Intellectual capacity, memory, Imagination powers & mental strength are variable in different individuals. God has gifted us with Super Brain which is much more power full than Super computer. But very few people know to utilize their brain with its complete ability. Lack of concentration & weakened memory span are widely seen in students now days. 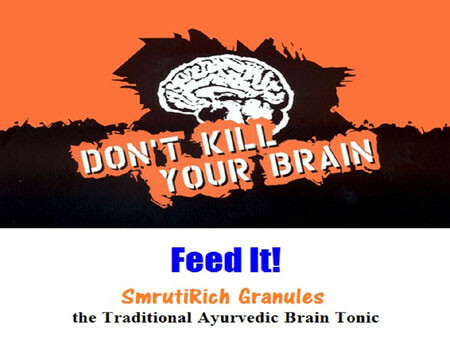 However, all these problems of our future smart generation will be resolved very soon with Dhanwantari’s proud product ” Smruti Rich Granules.” Lot of research was done in Ayurveda in ancient times on improving memory levels, concentration & mental strength. 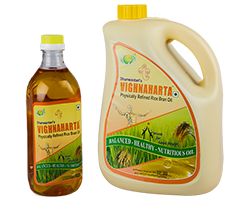 Ultimate results are seen with proper administration of few daily routine life aspects like appropriate healthy diet, proper daily routine, routine exercise, sound sleep, positive attitude & last but not least making use of few herbal medicines. Then how Smruti Rich is different? 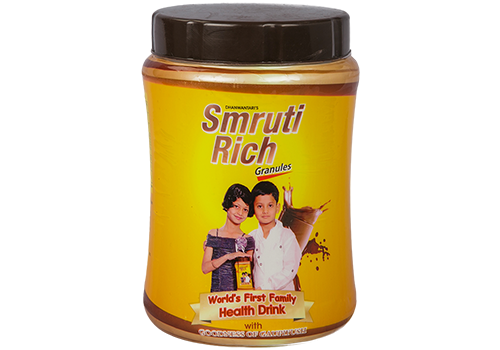 Because lot of research is done on its herbal contents at CDRI Luckhnow & NIMHNS Bangalore & it is scientifically proven that Smruti Rich is the best memory booster. Smruti Rich Granules’ uniqueness is its content “Cow colostrums”. 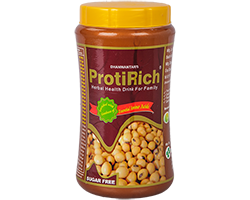 Smruti Rich Granules contain different rare species of herbs, which improve overall mental growth & the content of cow colostrum Nerve Growth Factor improves the memory span of brain. 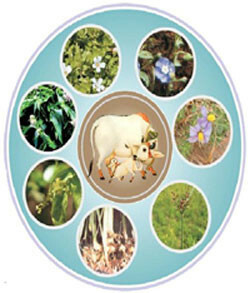 Whereas, ninety different content factors of cow colostrum boosts the complete physical health in growing children. 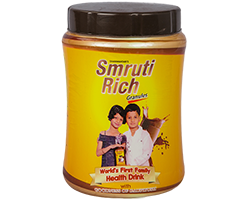 Smruti Rich Granules boosts mental as well as physical strength. For the same reasons it is also much beneficial for old age people. Nagarmotha: Remover of endo-toxins. Digestive and Carminative properties, Effective killer of intestinal worms, a diuretic and anti-pyretic medicine. Shankhapushpi: From ancient times, it has been used to improve mental power -Enhance memory. , useful in conditions like Alzheimer’s and Dementia. 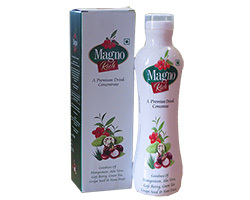 Used to treat hypertension, anxiety, irritation and many stress related problems, immunity booster. Neerbramhi: Nervine tonic, Anti-spasmodic, Sedative, Diuretic. Vacha: Nervine tonic, stimulate the brain and increase alertness and focus. It a curative for memory loss, and any attention deficit disorders. Kantkari: Useful in treating worms, cold, hoarseness of voice, fever, enlargement of the liver, muscular pain, spleen and stone in the urinary bladder. Jyotishmati: It balances Vata and Kapha.It improves digestion. 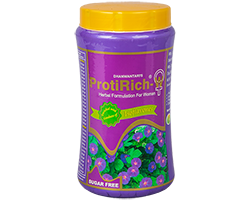 Improves intelligence & memory.Helps in quick wound healing, useful in anemia and liver disorders. 3. Improves mental as well as physical health. 5. 100% natural active ingredients, 100% safe with No Side Effects, No drug interaction. 6. Safe for all ages of men, women & children. 1 or 2 Teaspoon twice a day with glass of milk. Satara - 415002. M.S. (India). Toll Free No. : 1800 2330 0007. Dhanwantari Distributors Pvt. Ltd. © 2018 All rights reserved. Powered By: Namaksha Technologies Pune.